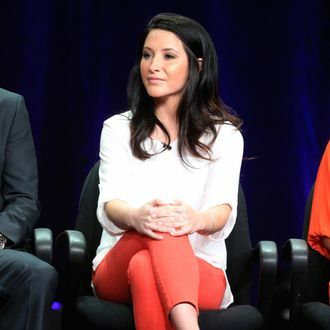 Bristol Palin says all of her deals to appear on reality-TV shows were brokered by God. Continuing this week’s Parade of Palins at the semiannual TV Critics Association press tour in Los Angeles, young Palin told scribes (repeatedly) that the Good Lord “provides opportunities” such as Dancing With the Stars, implying that for her to not do such shows would be to dis the Almighty. She also explained that since “the press is going to talk about me no matter what,” she might as well “have fun” by doing reality shows. But, Vulture asked, would reporters still be following Bristol Palin around rural Alaska had she simply decided to return home after the 2008 election rather than say yes to multiple reality-show offers? Palin didn’t really answer our question, except to repeat that reality TV is “a fun gig” and to thank God for bringing her so many offers.